Here Lies Love will play off-Broadway next year. Written by David Byrne (Talking Heads) and Fatboy Slim, the musical is a take on the life of Imelda Marcos, former first lady of The Philippines. The songs, drawn from the 2010 concept album of the same name, generally reflect Imelda’s penchant for clubbing. Vocals are clearly intended for the stage and are delivered by the likes of Florence Welch (Florence and the Machine), Tori Amos, Martha Wainwright, Steve Earle, Cyndi Lauper, Filipino jazz singer Charmaine Clamor, Sharon Jones, Kate Pierson (the B-52s) and others. It is a far cry from my cup of tea. But the idea is interesting, and it gives me a pretext for writing about the Philippines. Given I don’t like David Byrne’s songs, I’ll go with Elvis Presley’s ‘Mean Woman Blues’ to accompany this post. I think it’s quite fitting, as long as you take mean to be nasty or callous, not tight with money (which she definitely is not). Famous for being a beauty queen and for her gargantuan shoe collection, in many respects Imelda Marcos is a grotesque figure. Although many have drawn parallels between Imelda and Eva Peron (aka Evita), Imelda’s origins were far from humble. In fact her father was a law professor from a prominent, wealthy family. Imelda’s mother died when she was nine years old. After finishing an education degree in Tacloban she moved to Manila where she worked in music stores and gave singing performances. She married Ferdinand Marcos in 1953. He was elected President 12 years later. On 23 September 1972 Marcos declared martial law in response to violence led by the New People’s Army, an alliance between Communists young and old in the forms of the Communist Party of the Philippines (a group of young Communists who had split from the more established Partido Komunista ng Pilipinas (PKP) in 1968) and the Huks – the Hukbalahap, a peasant army set up by the PKP, initially to resist Japanese occupation. The US supported the martial law declaration, keen for stability on their military bases. During the protracted period of martial law Ferdinand suspended the country’s constitution, removed the two-party system and allowed only his own party to operate. He installed Imelda in a number of important government positions, including as a Minister and a Special Envoy. In the latter capacity she visited China, the Soviet Union, Cuba and a number of states in Eastern Europe and the Middle East. She later justified the exorbitant costs she racked up during this period – in which she was said to indulge in five million dollar shopping trips to New York and Rome, among other larger than life extravagances – by pointing to diplomatic successes. For instance she was involved in the 1976 Tripoli Agreement – brokered by then Libyan President Muammar Qaddafi – which lay the groundwork for (as yet still elusive) peace in the country’s Islamic south. In February 1986 Ferdinand faced increasing pressure and called a snap election. The election was contested by Corazon Aquino, widow of Benigno Aquino, Marcos’ main political rival until he was assassinated in 1983 (and Mother of current President Bengino Aquino III). The election’s aftermath was messy. Marcos refused to accept Aquino’s victory. An attempted military coup failed. Then on February 24 a number of Manila police and air force members defected. Ronald Reagan withdrew US support. Ferdinand and Imelda fled to Hawaii and Aquino was sworn in as President of a provisional government. Ferdinand died in exile in 1989. 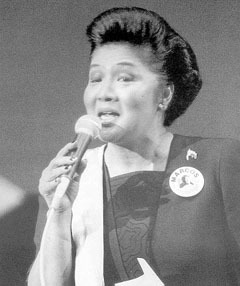 Imelda was acquitted of racketeering and fraud charges in the US in 1990. She still faces charges in the Philippines and the source of the Marcos’ vast wealth remains under investigation. Imelda has been engaged in Filipino politics since 1992 when she finished fifth in the Presidential race. She was elected to Congress in 1995, serving until her term expired in 1998. In 2010 she was again elected to the Filipino House of Representatives (in a seat previously held by her son Ferdinand Jr) vowing to clear her late husband’s name.